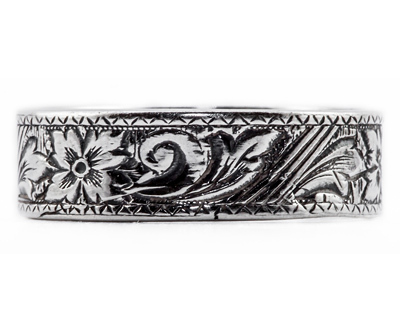 Our designers rummaged through original vintage hubs from the 1800s-1900s to find this unique estate-style vintage flower scroll heavily engraved wedding band and crafted it as a brand new jewelry creation in 14k white gold. Made from the original hubs that jewelers used in ages past, this is sure to be a rare find for your jewelry collection. Perfect for a wedding band ring or stand alone right-hand ring. Also available in 14k yellow gold or rose gold, 18k gold, or platinum by request or sterling silver (shown below). We guarantee our Flower Scroll Estate-Style Wedding Band in 14K White Gold to be high quality, authentic jewelry, as described above.